A study published in November 2008 issue of the Journal of Allergy and Clinical Immunology suggests that early consumption of peanuts might prevent peanut allergy. The researchers studied more than 10000 Jewish school children in the UK and in Israel. In spite of similar genetic background, the study showed that Jewish children in the UK have 10 times higher prevalence of peanut allergy than their counterparts in Israel. Israeli infants consume peanuts in the first year of life (between 8 to 14 months) whereas UK infants avoid peanuts. These findings raise the question of whether early introduction of peanuts, rather than avoidance, will prevent the development of peanut allergy! However, the authors caution against introducing peanuts to infants until further studies are done. Myth - Food allergies always show up during childhood. Fact - Though most food allergies show up in childhood, sometimes they show up in adolescence or later in life. Myth - Any negative reaction to food is food allergy. Fact - Not always. Food allergy involves the immune system. But some people might have a negative reaction to food which is called food intolerance and has nothing do with the immune system. A classic example of food intolerance is lactose intolerance. Lactose intolerant persons cannot digest milk properly and this manifests as bloating or flatulence or diarrhea. 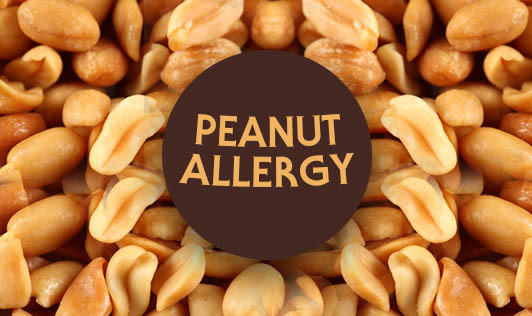 Food allergy occurs in 6 to 8 percent of children 4 years of age or under, and in 3.7 percent of adults.